READY TO COPY: Cookie, Niles Tower's operator this April 30, 1983 morning, tells the SP dispatcher that she is "Ready to copy." Note the blank train order form in the old manual Underwood typewriter. At above right is a 30-years-prior message from one of her predicessors, presumably giving the "all clear" to the SP crew that delayed Western Pacific #54'. See The Tower at Niles for more. There's no longer any reason for railroad professionals to study train orders, since TO's are further into the grave than the Latin language. But scholars still study Latin to get a clearer understanding of the past - translations can be notoriously innnacurate - and we maintain that the same holds true for train orders. 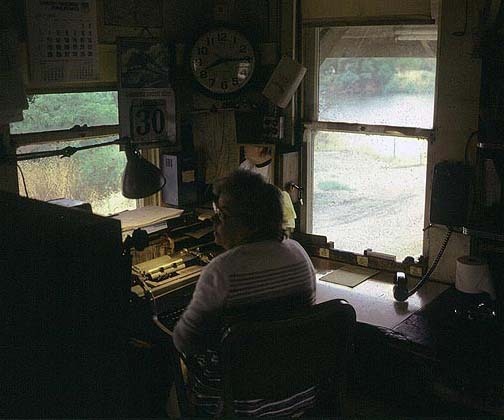 TO's often have stories to tell, and once that you have learned the lingo, a pile of orders will give you fascinating glimpses into your favorite railroad's ancient times. Train orders were composed using standard 'forms'. The term refers not to physical, pre-formatted paper sheets, but rather the highly structured language required in each type of train order. With a few exceptions, train orders were all written upon a single style of blank train order, er, 'form' (here, we mean the physical). So, a train order form contained one, or more, forms of train orders. Clear, yes? What we are going to do here is describe the basics of most, but not all, forms in terms of the 1983 SP book of rules, at the near-end of the train order era. Note that many of these forms (not dealing with authority / movement of trains) were also used in DTC and CTC and survived the demise of train order dispatching. Along with the forms, we'll also discuss some of the other rules and such that also provided authority and protection in the train order-based movement of trains. You can attck this at any of three levels of comprehension. To gain a cursory understanding without eating into time set aside for watching Survivor - Monaco, consult the center column, below. More interesting, though, are further-explanation pages accessed by clicking upon the images in the right column, below. These pages contain some pretty cool train orders, we think, from the 1940's - 1980's, along with hopefully-not-too-long-winded anecdotal explanations. The third level - not recommended, mind you - is to hit the pawn shops for an old book of rules and study it chapter and verse as you progress through our offerings. Frankly, this could be as agonizing as watching Survivor, but its up to you. First, we'll take a look at a selection of the most significant forms used with Southern Pacific train orders, then we'll bring it all together. Note that every railroad had its own system of train orders, each with its own arcane peculiarities. Many railroads used From 19 and Form 31 orders, which are discussed on the Train Orders From Other RR's page. Readers'note: Again, the following is presented in the present tense, because it's easier to write it that way. Telegrams such as the one at left and at page top often accompany train orders and contained all manner of instructions and information. 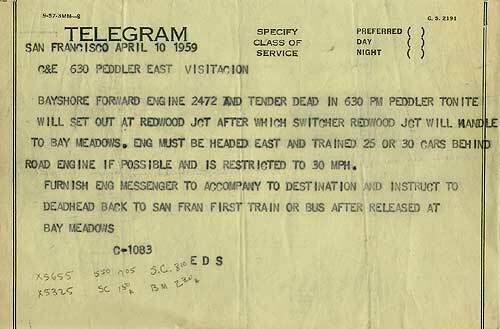 Probably the most common telegram message directs a crew to pick up cars en route, and thus sometimes get "lost" somehow in the process of delivery. Radios have pretty-well eliminated this bit of skullduggery. Telegrams can make for interesting reading, yes? Rule 93 Within yard limits, a train or engine's 'form' of authority isn't a train order, but rather Rule 93, rightfully enough called the "yard limits rule". Understand that yard tracks are not main tracks, and are covered by an "other than main track" rule. Yard limits exist on main tracks only, and are physically defined by yard limit signs, 'yard boards' (right). The location of yard limits can be found in the station column of the employee timetable. In practical terms, this listing is unnecessary, since everyone knows where the boards are, and the only timetable that a switchman owns is the one that he received the day he hired out, that now resides in a puddle of water under the spare tire in the leaky trunk of his '64 Plymoth Fury...which the wife now drives. This rule allows the dispatcher to tend to duties higher than authorizing switch engines to make routine back and forth moves. D&RGW yard board; SP's sign was similar, but unlettered and painted yellow. 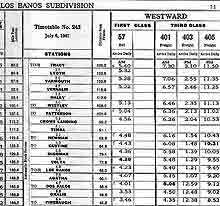 Clearance Clearance: When train orders are delivered to a crew at an open train order office, they come with an attached cover sheet known as a clearance, which lists the orders delived by number. The clearance also authorizes a train at its originating station, but the train requires additional authority to move beyond that point. As you will recall from Part I, the employee timetable plays a major role in train order territory. It designates a regular train's class and gives it authority to operate over a given territory on a schedule that other trains must respect. The timetable, and the accompanying timetable special instructions, also contain an enormous amount of geographically specific information that can be classified as protection: meeting points for opposing regular trains; siding lengths; speed limits; etc., etc. In days past, a switchman kept the only timetable that he ever owned - the one given to him when he hired-out 23 years prior - safely locked in the trunk of his car underneath an accumulation of booty pirated from local industrial customers. A road crewmember, on the other hand, was absolutely expected to keep a timetable stuck in his back pocket while working on the ground. E.O., as a young fireman, once got thirty demerits from an over-enthusiastic road foreman of engines who witnessed him handing up his grip-contaning-timetable to the engineer, who preceeded him onto the engine. Authority, Other Than Train Order Even in the 'good old days', trains on a considerable amount of railroad territory were authorized by means other than train orders. On SP, controlled (absolute) signal indication and Rule D-251 were the other primary, but not the only, means to grant authority. Controlled signals authorize train movements in C.T.C. and interlocking territories. C.T.C signals are controlled by the dispatcher, while interlocking signals - used at terminals, junctions and drawbridges - are often controlled by an interlocking operator. Many interlockings operate automatically, sans operator. 'D-251 Territory' is what SP railroaders call double track. In double track, each track has a current of direction, and trains run on block (non-absolute) signal indication without regard for the superiority of trains. Via train order, trains still may be instructed to take a siding, or authorized to run against the current of traffic. The latter case, in effect, temporarily turns the D-251 Territory into train order territory. Entry into 251 can either be by (any sort of) signal indication, the highball from a herder (switchtender), or by crew-provided protection at points where there is no governing signal. Extra Train: A Form G train order is the standard method to authorizie an extra train to move in a single direction between two points. This form of running order is often combined with other forms, as we shall see later. The above is the simplest of the eight basic variations of the form . Local freights, road switchers and work trains often must make several trips back-and-forth within a territory, so a Form H train order is employed to allow movement in either direction as required within a specified time. The Form H rule gets very involved (5.5 pages-worth in the 1983 SP Book of Rules), particularly if multiple Work Extras are authorized within the same limits. Matters of required protection and superiority verses other trains are enumerated on the order. Rule 93 Not only does Rule 93 give engines the ability to operate on main track without train order authority within yard limits, it also specifies the structure of protection, as well. The rule (SP 1930 version at page right) slowly grew ever more complex over the years (see the 1982 rendition in the In Depth discussion), but the main thing to remember is that protection requirements within yard limits were relaxed in many ways. So, as you go on duty at 'O-dark-thirty' in pre-CTC days in that wonderful Garden of Eden - Lordsburg, New Mexico - and you hear a train rumble by. Is it a regular train, an extra, or merely a runaway that a crew forgot to tie down? Obviously, when you first go on duty, somebody has to ascertain the lay of the land before your crew is in position to begin visually ID'ing trains. The conductor does this by checking the station's train register, which lists the arrivals and departures of all regular, and some extra, trains. He copies the last twelve hours worth of trains onto a Check of Train Register (a.k.a. : register check), with copies for himself and the engineer. Extra trains not originating or terminating there have to be identified by train order, so if you have a train order stating that you may not depart until after the Extra 3601 East has gone by, you need a train order confirming your suspicions that it is the one rumbling past the yard office. Flat Meet While timetable schedules often list meeting points between regular trains, meets involving two extra trains must be otherwise provided for. A common method is to arrange a fixed meeting point, commonly known as a 'flat meet', using a Form S-A train order. Essentially this is how all meets are arranged in today's track warrant systems - in both cases the dispatcher decides exactly where trains are to pass, rather than give T&E crews some leeway in deciding a meeting point. The downside of a fixed meet is that if one train breaks down, the other train is left hung out to dry at the meeting point until new orders can be cut and delivered. We already know how time-consuming that this can be, eh? One way for a dispatcher to get an extra train around several other extras is to give the train a schedule using a train order. That way the oppposing trains know that the train will not depart a given point before a given time, and they can make arrangements accordingly. These 'time orders' as they are officially called, can be as simle as "ENG 1, WAIT AT ELEMENTARY UNTIL 101 AM" . This is called a 'wait order', but a more common form is what is called the 'column wait' in SP railroad vernacular. A column waits can exist by itself as a Form E (right), or as an integral part of several other types of forms. Note that time orders can appear by themselves as a Form E or S-E, but that several other forms contain time order elements. It's an imperfect world that we live in, and railroads probably are more imperfect than the cosmic average, so a host of orders exist to warn crews of conditions that might restrict, or otherwise affect, movement. These range from speed restrictions, to tracks or signals taken out of service, to Conditional Stops for track work, to footing conditions and notification of impending volcanic eruptions, if need be. Changing Orders Mistakes are made; plans go awry...thus train orders are often modified or dumpstered. Although your head may be spinning from all of this, if you remember the basics and realize that, despite the multitude of forms, there are really not that many different ways to move trains (in truth, many of the the technicalities of each form are more the dispatchers' worry, than the crews'). The Form B (above) directs a train to pass, or run ahead of another train, but if the 4354 throws a rod, it can allow #75, the Lark, to pass. THE POINT WHERE TIME APPLIES: Remember, time hath no meaning on the railroad unless you knoweth whereth it applyeth. AUTHORITY: You need either train order (Form G or H), Rule D-251 (double track) timetable schedule, or controlled signal indication to operate in train order territory. Know that authority to occupy main track only applies BETWEEN stations named on train orders. We have some lulus in our collection, but nothing to match this formidable example of the dispatchers' art pirated (with permission) from page 25 of the Spring, 2004 issue of the SP Trainline. If you can figure out this one, you've arrived. Bonus Question: Without reading the associated commentary, what mistakes did the dispatcher make in this set of orders for the Santa Rosa Work Train? In which direction can you go out of Santa Rosa and be authorized to return without further orders. The answers are in the commentary. Congratulations on completing the course! You now possess a skills set that has absoluely no useful application, excepting either to compete in a railroad trivia contest, or as we said in the beginning, to preevent your valuable Lionel Blue Comet from colliding with a switch engine. At least you now know more about the theoretics of moving trains than many present-day railroaders, for whatever that's worth.